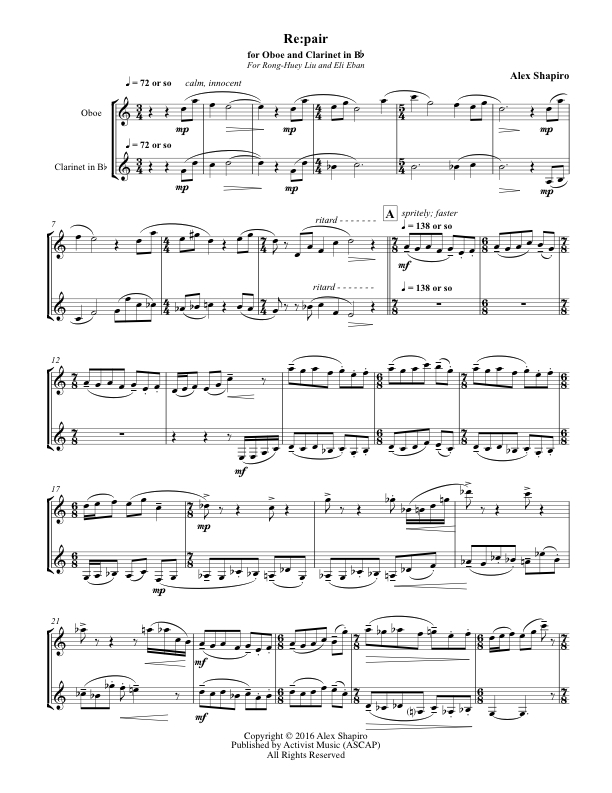 (Duet for Baroque or Modern Flutes). Commissioned in 2000 by flutists Tom Moore and Laura Ronai. One movement work. 13 pages, 8.5" x 11". by Tom Moore and Laura Ronai. by Patti Cloud, flute and Carolyn Beck, bassoon. by Penelope Clarke, flute and Colleen Gibson, oboe. Audio clip performed by Pamela Vliek Martchev, flute and Rong-Huey Liu, oboe. by Ling-Fei Kang, oboe and Charles Huang, English horn. Audio clip performed by Mateo Mendez,English horn and Kesem Shaier, oboe. One movement work. 9 pages, 8.5" x 11". by Rong-Huey Liu, oboe and Eli Eban, clarinet. "Musical pickings are sparse during the summer months, but rewards await the ardent serendipiter... I happened upon an eminently satisfying chamber-music concert in a UCLA lecture hall, and was glad I did. The players were five members of Mládí, the ensemble whose wintertime programs in an old apartment building near Silver Lake I have also found reason to praise... The Bruman concerts are solid, interesting and challenging. Last week’s program consisted of four new or newish works for winds. 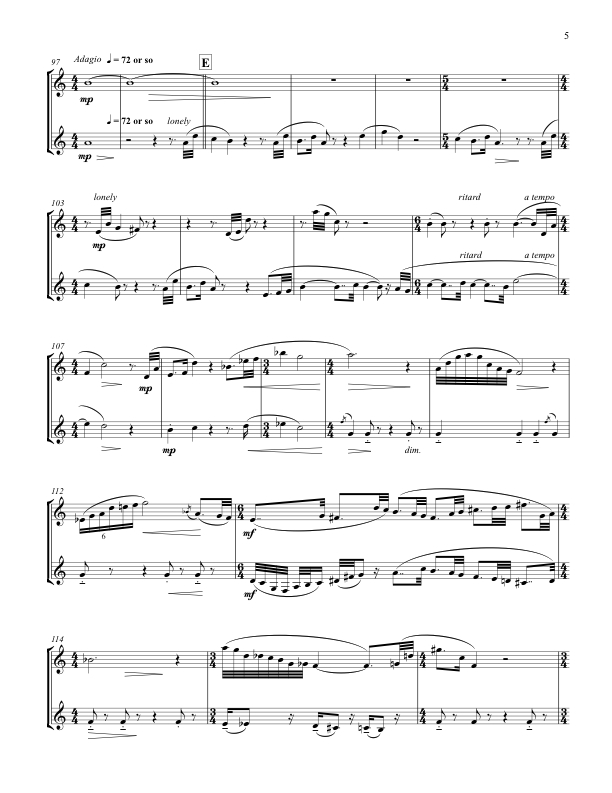 One, a perky and thoroughly delightful duet for flute and oboe by the local composer Alex Shapiro, was brand-new, and Shapiro was on hand to deliver a few words about her piece..."
Score and parts available from Activist Music for $15.00 print; $10.00 digital. Re:pair was originally composed for two baroque flutes, at the request of Tom Moore and Laura Ronai, two baroque flutists who enjoy the somewhat unusual mission of presenting audiences with contemporary music written for their instruments. The title is a triple entendre: fixing something that in some cases is... baroque (ouch), having to do with a duo, and then having that duo musically deconstruct and pair up again. I took a very modal approach to this piece, using harmonies and rhythms that refer to music from a few hundred years ago, while placing them in a contemporary context. Although I wrote Re:pair specifically for baroque instruments, it sounds equally well on modern flutes, and other woodwinds as well. These additional versions employ a few higher pitched notes, for a brighter sound than what would traditionally be written for wooden flutes.